This profile is based on a copy of Generalleutnant Weckmann’s microfilmed service record housed at the United States National Archives and Records Administration in Washington, D.C.
Parents: Stabszahlmeister a.D. Paul and Margarete (née Baumann) Weckmann. Wife: Married Erika Lange (born 28 April 1907) on 17 November 1927 in Berlin – one daughter. Easter 1905-Easter 1914: Attended the Grand Ducal Domschule (Humanistic Gymnasium) in Güstrow, Mecklenburg; obtained his Abitur or certificate of graduation from that institution. 14 March 1914: Entered the Army as a Fahnenjunker in the 3. Posensches Infanterie-Regiment Nr.58. 7 August 1914: In the field with the 3rd Company of Infantry Regiment 58. 22 August 1914: Wounded/treated at the front and remained with the troops. 27 September 1914: Wounded/treated at the front and remained with the troops. 24 October 1914: Wounded/treated at the front and remained with the troops. 27 October 1914: Wounded/transferred to the Reserve Hospital at Zabern. 8 November 1914: Transferred to the I. Replacement Battalion of Infantry Regiment 58. 14 April 1915: In the field with Infantry Regiment 58. 2 May 1915: Wounded/treated at the front and remained with the troops. 4 May 1915: Wounded/transferred to the Reserve Hospital at Passau and then to the Military Association Hospital in Güstrow, Mecklenburg. 13 December 1915: Transferred to the I. Replacement Battalion of Infantry Regiment 58. 27 December 1915: Detached to the Deputy General Staff as an Ordonnanz-Offizier. 19 February 1917: Detached to the Railway Department of the Deputy General Staff as Adjutant. 29 March 1917: Transferred to the Department of Transportation Military Science/Chief of the Field Railway Service. 21 May 1917: Placed at the disposal of the General Command of the I Army Corps in the Zloczow District for employment. 5 January 1918: Placed at the disposal of the Department of Transportation Military Science/Chief of the Field Railway Service for employment. 26 March 1918: Detached to Line Commandant F at Karlsruhe. 19 April 1918: Detached to the Chief of the Kiev Field Railway. 1 June 1918: Transferred to the Warsaw Military Railway Directorate while retaining his previous post with the Chief of the Kiev Field Railway. 20 July 1918: Transferred to the staff of the Chief of the Kiev Field Railway as Adjutant. 12 November 1918: Placed at the disposal of the XXVII Reserve Corps for employment. 17 November 1918: Transferred to Infantry Regiment 434 and detached to the District Commandant 350 to serve as Adjutant. 25 November 1918: Transferred to the District Commandant 350 as Adjutant. 21 October 1919: Leader of Company “Weckmann” formed from Volunteer Battalion 41. 1 May 1920: Leader of the 2nd Company of Reichswehr Infantry Regiment 39 of Reichswehr-Brigade 20. 1 October 1920: Transferred as a Platoon Leader to the 1st Company of the 2nd (Prussian) Infantry Regiment upon the formation of the new Reichsheer from the Übergangsheer or Transitional Army. 15 January 1921: Detached to the staff of the I. Battalion of the 2nd (Prussian) Infantry Regiment as Adjutant. 8 April 1921: Returned to the 1st Company of the 2nd (Prussian) Infantry Regiment. 1 May 1922: Adjutant of the III. Battalion of the 2nd (Prussian) Infantry Regiment. 1 July 1922: Adjutant of the Training Battalion of the 2nd (Prussian) Infantry Regiment. 1 October 1923: Transferred to the 2nd (Prussian) Reiter [Mounted]-Regiment and detached to the staff of Wehrkreis [Military District] Command I, Königsberg. 1 October 1924: Transferred to the regimental staff of the 2nd (Prussian) Infantry Regiment. 1 February 1925: Transferred to the 7th Company of the 2nd (Prussian) Infantry Regiment. 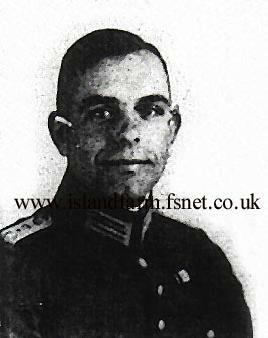 1 October 1925: Transferred to the 4th (Machinegun) Company of the 2nd (Prussian) Infantry Regiment. 11 January 1926-13 February 1926: Detached to the 1st (Prussian) Artillery Regiment. 1 October 1926: Transferred to the Reich Defense Ministry. 1 October 1927: Transferred to the 1st Squadron of the 13th (Prussian) Reiter-Regiment and detached to the staff of the 4th Division. 2-30 June 1927: Detached to the 5th Signals Battalion. 2-31 August 1927: Detached to the 5th Pioneer Battalion. 2-30 September 1927: Detached to the 5th Motorized Battalion. 1 April 1928: Transferred to the Training Squadron of the 12th (Saxon) Reiter-Regiment. 24 February 1929-3 March 1929: Detached to Gas Protection Course E in Berlin. 1 January 1930: Transferred to the regimental staff of the 12th (Saxon) Reiter-Regiment. 1 April 1930: Transferred to the 9th (Prussian) Infantry Regiment and appointed Chief of the 11th Company – reverted to the rank title of Hauptmann. 1 February 1933-30 April 1933: Detached to the staff of Group Command 1, Berlin. 1 April 1933: Transferred to the staff of Artillery Leader II, Stettin (detached service to Group Command 1 cancelled effective this date). 1 October 1933: Wehrgauleitung [Military District Command] Stettin (Artillery Leader II). 1 October 1934: Transferred to the General Staff of Artillery Leader II, Stettin. 15 October 1935: Transferred to the General Staff of the 2nd Division. 2 July 1936: Transferred to the General Staff of Heeresdienststelle [Army Command Center] 7, Stuttgart. 1 August 1938: Transferred to the General Staff of the War Academy as a Tactics Instructor. 14 January 1942-20 February 1942: Army High Command Leader Reserve – duties determined by the Deputy Commanding General of the III Army Corps and the Commander of Wehrkreis III, Berlin. 20 February 1942-1 March 1943: Commander of the General Staff Course. 1 March 1943-1 June 1944: Commander of the War Academy. 1 June 1944-27 October 1944: Army High Command Leader Reserve – duties determined by the Deputy Commanding General of the V Army Corps and the Commander of Wehrkreis V, Stuttgart. 27 October 1944-26 December 1944: Delegated with the leadership of the 274th Infantry Division in Norway. German Cross in Gold: 26 February 1942, Oberst, Chief of the General Staff of the 9th Army. Prussian Iron Cross, 1st Class (1914): 6 November 1918. Prussian Iron Cross, 2nd Class (1914): 24 October 1914. Mecklenburg-Schwerin Military Merit Cross, 1st Class: 4 October 1917. Mecklenburg-Schwerin Military Merit Cross, 2nd Class: 16 March 1915. Cross of Honor for Combatants 1914-1918: 20 December 1934. Wound Badge in Gold – World War I award: 22 June 1918. Bug Star (Bugstern): 26 February 1919. Finnish Order of the Cross of Liberty, 1st Class with Swords: 15 August 1943. 22-27 August 1914: Battle of Longwy—Longuyon and the Othain Sector. 28 August 1914-18 September 1914: Positional combat at Verdun. 18-24 September 1914: Combat between the Maas and the Mosel. 1-3 May 1915: Battle of Gorlice-Tarnow. 4 May 1915: Breakthrough following the Battle of Gorlice-Tarnow (wounded). 30 June 1917-6 July 1917: Defensive battle east of Zloczow. 7-18 July 1917: Positional combat east of Zloczow. 19-28 July 1917: Breakthrough battle in Eastern Galicia. 29 July 1917-7 December 1917: Positional combat on the Sereth River. 19 April 1918-21 June 1918: Combat in support of the Ukraine. 22 June 1918-15 November 1918: Occupation of the Ukraine. 16 November 1918-24 January 1919: Evacuation of the Ukraine.